If you love good music at all, your hair stands on end. MOHAMMED RAFI, recorded 45 years ago, does that to M BHAKTAVATSALA and BASHEER MEKRI. The two of us met almost half a century ago, on June 7, 1949, to be precise. Bhakta had come from the hinterland to study at the (to him) highly anglicised, St Joseph’s. Basheer was all Bangalore and son of the most famous eye doctor in old Mysore, to boot. Love of music brought us together. Though singing cinema (early cinema was all songs and little talk) had come quite some time ago, it was at this time that film music took a total and completely unexpected turn. The old tuffs called it western influence. Maybe, but somehow it immediately appealed to us. Every morning Radio Ceylon poured out a bucketful of dew-fresh ones, each more scintilating than the other. But in the Contonment one was ashamed to talk of hindi songs. After all, those were the glorius days of the Eurasian beauties. One only sang Bing Crosby to them. So we talked of hindi songs sureptitiously and little did we know that the anonymous singers, lyricists and music directors were to become household names half a century hence! Bhakta’s Shimoga was still into classical – pure South Indian or rather old Mysore – music, and looked upon film music as vulgar. One barely noticed the second singer after Mukesh and Talat in Mela and Babul – even after Tera Khilona Toota Balak in Anmol Ghadi (1946). In 1947, when Saajan came with Hum ko Tumhara hi aasra and then Jugnu with the fantastic duet with Noor Jehan, Yahan Badla Wafa Ka, one could hardly not inquire. You see, the old shellac discs carried the names of the characters in the film that mouthed the songs and not of the singers. Only later did the playback artists earn the right to have their names on the shellac. At any rate, very few fortunate ones like Bhakta could buy shellacs. Others would come home and crowd around their song books when he played them on his old HMV gramaphone, which could be heard all down the road. Rafi’s name filtered into our consciousness soon after. It took Raj Kapoor to push Mukesh as a name and Dilip Kumar to do the same for Rafi. Their faces and those voices were to our generation inseparable. In such a world his appearance, much less his biography, was not of much interest. No newspaper (there were hardly any film magazines save Film India of Babu Rao Patel) was interested in even mentioning music men, let alone publishing their photographs. So no wonder that though we had seen Nazir’s Laila Majnu in 1945 and Jugnu in 1947 several times, we had not noticed Rafi who appears briefly in group scenes in both the films. Not surprisingly, a mischievous rumour caught on among us, the apologetic lovers of Hindi songs, that Rafi was a pockmarked, ugly man, who can never act and will continue only to sing, that is, if the singing stars allow him. We did not know then that singing stars would disappear. For the record, Rafi’s biography brief it must be for a lot is not known – is that he was born in Kotta Sultan Singh village in Punjab (now in Pakistan) in 1924. He moved to Lahore at the age of 14 and studied music under Khan Abdul Wajeed Khan, Jeevanlal Matto and Gulshan Ali Khan. Composer Feroz Nizami (who did Jugnu) introduced him on Radio Lahore. His film debut was in a Punjabi film Gul Baloch (1944) with the music director Shyam Sunder. But his real music mentor was Naushad, who gave him his break when he arrived in Bombay in Pehle Aaap (1944). It was Naushad indeed who saw Rafi through to the realization of his full capabilities with Deedar and Baiju Bawra and S D Burman who refined him further (no Punjabi inflections) starting with Nau Do Gyarah, and O P Nayyar who gave him the carefree touch commencing with Aaar Paar. And Roshan started him on the shayari trail in Barsaat Ki Raat, which was destined to change the nature of the film songs for the next two decades. He could make you cry like in Meri Kahani (Deedar), he could make you want to romance like in Pukarta Chala Hun Mein (Mere Sanam), he could make you laugh like in Baap Bada Na Bhayya (Sargam). Now for personal reminiscences. Recalls Naushad, A Skimpy little boy in a white shirt came to see me in Bombay with a reference from someone I knew. He had a perpetual smile on his face. A little nervous, he confided that his greatest ambition was to sing with Kundan Lal Saigal, the melody king of the ’40s Naushad fulfilled that dream of Rafi’s and got him to sing in Shahjehan with Saigal – the song Mere Sapnon ki Raani. Basheer knew Naushad for quite some time and thus had known of Rafi, but he got to meet him only in 1976 when he got him over a concert shivajinagar, Bangalore, in 1947. And then again when Rafi was passing through on the way to Coimbatore and had a stopover for two hours and had called from Bombay and asked to meet the ‘doctor who sings’, Basheer went with his favourite food, prawn curry and rice. The next year, Basheer went to Bombay and called on him at his house. He cannot forget the hospitality he got from Rafi. 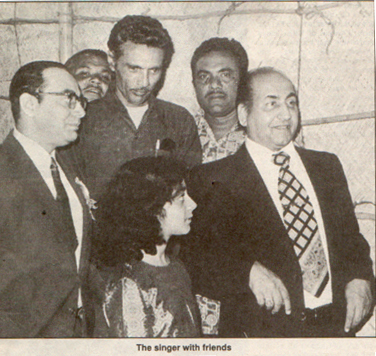 Basheer recalls Rafi as a short man of five feet who was always smiling. Surprisingly, his speaking voice was a bit squeaky. “You can ask me to sing as much as you want, but I cannot talk much.” Basheer’s little daughter mentioned her favourite two songs. He put her on his lap and sang them for her – Basheer’s fondest memory. Bhakta did not know he was going to end up in the film industry. Eventually he found himself as the President of the Film Federation. At Talkatora Statdium during the National Film Festival, tired of coaching Smita Patil, he had moved across to be a listener in a conversation between some friends and Rafi. That was in 1979 and Rafi was there to accept the National Award for the best song of the year Kya Huva Tera Vaada from Hum Kisise Kam Nahin. He sang that song that evening without a flaw, while Smita Patil goofed by passing over the address by President Sanjeeva Reddy. Bhakta apologised. The President, in his address, advised that we should have comperes from AIR! Next year, i.e. 1980, Rafi died suddenly. He was only 56. It is now 18 years since he passed away – little knowing how his voice would grow with each passing year. There are any number of ‘version’ voices of Rafi. A Rafi clone, as Anil Biswas said, is dime a dozen but not Talat’s. It is just that everyone wants to be Rafi, but a clone is always a clone. As Naushad said, many sing like him but there cannot be another Rafi. The voice quality is assessed on several parametres. The major one is the registers. In the west it is linear – bottom heavy ascending to very light transcending the ‘middle’ voice. But our music demands intricate forays into each register. Rafi was a master of that for in ‘swell tones’, i.e. the crescendo, his voice never lost the essential heaviness, the quality of timbre. ( Compare Lata’s reediness, and Talat’s lack of heaviness.) He could easily transcend also from ‘focus’ to ‘open throat’ and back. So also the pulsation in pitch accompanied by fluctuations in intensity. But Rafi, over and above everything else, scores in resonance – skill of producing a fantastic range of vocal tone colours accurately depicting the mood and emotional content of a song – without ever straining. He is the best singer on the breath – the portamento style – the sounding pouring out and not pushed out. There are any number of attempts of reworking him. No way. When he sang, a music maestro conducted, the lyricist (who was a poet) honed the words, and individual instrumentalists (not key board machines) played (many of them later to hold batons themselves), and a magic came to be. Give us that old shellac complete with the scratch noise. We have a piece of history there. It is sacrilege to meddle with that. Just put on O Duniya Ke Rakhwale from Baiju Bawra. It exemplifies all that we mentioned above and more. If you love music at all, your hair will stand on end. Rafi’s voice, recorded 45 years ago, does that to you. Like he does it to Basheer and Bhakta, with almost every song of the 50s and 60s. This entry was posted on Sunday, August 23rd, 1998 at 12:13 am	and is filed under Newspapers. You can follow any responses to this entry through the RSS 2.0 feed. You can leave a response, or trackback from your own site.